This inset of Edward Hopper's Lighthouse at Two Lights that I magnetblogged about before, is supercool. If you go back to the original magnet, and compare it with this, and the Met link above, it's amazing how these art magnets change colors depending on the production process and the image resolution they're reproduced at. Technically, I suppose the colors also depend on how you look at the image, and ultimately even the person who is looking at it. It's much like watching LOST. The show means so many different things to different people - everyone has their own set of theories about it. I said last year that I was just going to enjoy the show for what it was. That I wasn't going to make my head crazy by trying to figure out the ins and of the plot, the story, the characters, the time frames, the whatevers. For me, there was just no sense in becoming obsessed with the details. I kinda realized that I was out of control the day that I stayed on hold for like half an hour having called in to that one marketing number, freaking myself out, wondering what secrets would unfold on the phone. 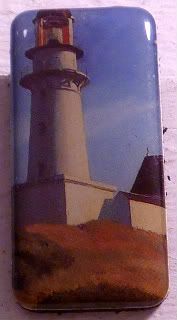 Of course, I'm using this magnet for today, because I'm still trying to figure out how they built that lighthouse that Jack destroyed - how'd they build it to reflect the lives of the candidates on LOST? Did they answer that question? Probably, and I just had to move on. I've had to put LOST on self-imposed hiatus since the beginning of March - and now that I finally watched 11 episodes back to back yesterday and today, I cannot believe how much I managed to stay unspoiled for! Like, boom, went the sub! Today's backend of the marathon included a 3-hour break for the Last LOST Weekend at the Paley Center. It was a screening of the pop-up pilot, and then a panel with a couple of my favorite crix, @Sepinwall and @poniewozik. So fun. But, now that I'm totally caught up before the show's finale, I find myself wondering what people will be feeling tomorrow night at this time. Of course, everyone better than to think that tomorrow, when the LOST end credits roll, that half the questions we've asked over the last several years will be answered, or even addressed. I just hope that when the box set comes out, that they'll put in the writers room storyboard and timeline tracker. That, I would pay big money for. Folks. Things are going to start leaking. Resist. It's Christmas Eve. You've made it this far. Don't read it. EXPERIENCE IT. Please. Of course, I dunno how to take that...I open my Christmas presents on Christmas Eve!